The use, possession, manufacture, or distribution of illegal drugs is a drug crime. The United States has policies in place to reduce and especially prevent drug abuse and drug crimes. Unfortunately, very few people understand what they are and how they can affect people’s everyday lives. Thus, as a law-abiding citizen who may get involved in drug crimes not even known to you, the best tool you have is knowledge about what drug crimes truly are and what they are not. If your housemate hid illegal drugs in your apartment or vehicle without you knowing, you can get away from this since you do not own them. Even if your name is not written on the packaging of the drugs, you cannot just run away. It is funny and obvious, yet true. Federal and state drug possession laws define constructive possession as the accused having access to illegal drugs. Despite the fact that the drugs were not found inside your own room, you can still be charged with drug crime. This is because you have the keys to your apartment where illegal drugs were found. Whenever policemen come by my doorstep, I must let them in immediately to check my apartment or vehicle for any hidden illegal drugs. Some members of the police may be intimidating because of their uniform and presence. Know, however, that you have the right to ask for a search warrant. Politely ask them to slide the warrant underneath the door. If they fail to show you a court-issued warrant, refuse to open the door. If the police find any illegal drug or equipment without a search warrant, this evidence will be no good. Your drug charges will have to be dismissed. A first offense drug crime is nothing to worry about. This is completely false. People may be sentenced to a certain time in prison although it is their first conviction. 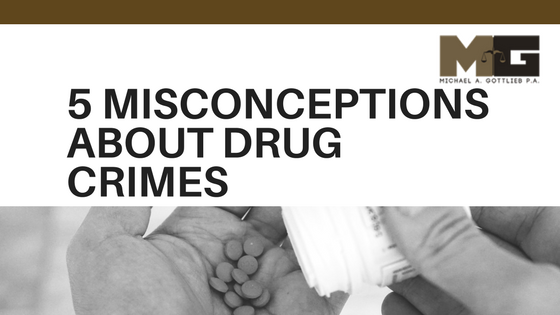 Any drug crime, whether first or second offense and no matter how small or big, is still a drug crime. By being involved in crime, you get your clean record stained. This makes it difficult for you to get yourself hired and that is something to worry about. Marijuana use is legal as long as you are in the United States. According to Business Insider, marijuana is only legal in 9 out of 50 American states. These are Alaska, California, Colorado, Maine, Massachusetts, Nevada, Oregon, Washington, and DC. It is also important to take note of the amount each state allows. Seeking legal advice from criminal defense attorneys for a minor drug crime is a waste of time and resources. Wrong. Being proactive in your own case gives the court a different view of who you are as a person. Instead of being a know-it-all, be down-to-earth and contact a lawyer to discuss your case. Your drug crime may be minor, but a professional defender is always of great help. Asking for help is never wrong. As has been proven over the years, allowing an experienced criminal defense attorney to take over will increase your chances of winning your case. With this, you are guaranteed to get your life back free of criminal charges.